A heart valve acts as a check valve, opening and closing to control blood flow. This cycle occurs about 40 million times per year or two billion in an average lifetime. Natural valves can develop several problems, either the valve opening becomes narrow or may not close completely. The first condition decreases the pumping efficiency and limits the amount of blood pumped to the body. The second condition can reduce the amount of blood to the rest of the body, as well as result in excess pressure in the lungs, also limiting their efficiency. In the United States, more than 80,000 adults undergo surgical procedures to repair or replace damaged heart valves every year. Artificial heart valves consist of an orifice, through which blood flows, and a mechanism that closes and opens the orifice. There are two types of artificial heart valves: mechanical devices made from synthetic materials; and biological or tissue valves made from animal or human tissue. In general, biological valves are used for patients who are over 65 or cannot take anticoagulants. 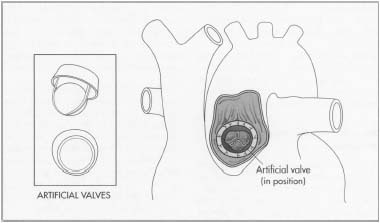 Mechanical valves are used for patients that have a mechanical valve in another position, have had a stroke, require double valve replacement, and usually are recommended for those under 40. These type of valves require the patient to take anti-coagulating drugs. Mechanical valves can be further broken down into three types based on the opening and closing mechanism. These mechanisms are: a reciprocating ball, a tilting disk, or two semicircular hinged leaflets. The first type is based on a ball-in-cage design, which uses a rubber ball that oscillates in a metal cage made from a cobalt-chromium alloy. When the valve opens, blood flows through a primary orifice and a secondary orifice between the ball and housing. About 200,000 of these have been implanted. The tilting disk valve uses a circular disk retained by wire-like arms that project into the orifice. When the disk opens, the primary orifice is separated into two unequal orifices. About 360,000 of these valves have been implanted. The current design consists of two semicircular leaflets connected to the orifice housing by a hinge mechanism. The leaflets separate during opening, producing three flow areas in the center and on the sides. Over 600,000 bileaflet valves have been implanted. The first recorded surgical operation on a heart valve took place in 1913. Replacement of diseased valves did not take place until 1962, when the first successful biological valves were invented using human tissue from a donor. Ball valves were the first type of mechanical valves and were developed around the same time. Miles Edwards, an electrical engineer who founded a medical device company called American Edwards Laboratories in the 1950s, is credited with co-inventing the first commercially available artificial heart valve. Disk valves became popular in the 1970s after the first successful design was introduced in 1969. The reduced height improved clinical performance. The bileaflet design was first introduced in 1977 and became more popular during the 1980s. Artificial heart valves consist of an orifice, through which blood flows, and a mechanism that closes and opens the orifice. scientist Dr. J. C. Bokros from the General Atomic Company was investigating pyrolytic carbon materials for nuclear fuel applications. Because the material's properties were suitable for biomedical applications (durability, blood compatibility), he looked at it for making artificial heart valves. Today, about 90% of all mechanical heart valves implanted have at least one pyrolytic carbon part. In 1976, medical devices (including prosthetic heart valves) came under the jurisdiction of the Food and Drug Adminstration (FDA). FDA then issued guidelines for Premarket Approval (PMA) applications for heart valves. In 1993, FDA issued a guidance document based on objective performance criteria. This set the minimum amount of follow-up required for a PMA study at 800 valve-years. The performance of mechanical valves has been noteworthy. The ball valve, in use for over 30 years, has had only a dozen structural problems that caused no major harm to the patient. The tilt valve had fewer than 1% of failures after 15 years of experience. The most popular type of bileaflet valve only reported several dozen failures to the FDA. However, in early 2000, one valve manufacturer recalled silver-coated valves because of a leaking problem in 2% of patients. In all, there have only been about 50 failures out of the approximately one million valves in service. Approximately 265,000 prosthetic valves are now implanted worldwide each year, valued at over $700 million. About 60% of these are mechanical valves, with a market value of around $400 million. Over two million mechanical valves have been implanted in patients around the world during the last several decades. Most artificial valves are made of titanium, graphite, pyrolytic carbon, and polyester. The titanium is used for the housing or outer ring, graphite coated with pyrolytic carbon is used for the bileaflets, and 100% pyrolytic carbon is used for the inner ring. The pyrolytic carbon is sometimes impregnated with tungsten so that the valve can easily be seen following implantation). The sewing cuff, used to attach the valve to the heart, is made out of double velour polyester. Titanium is used for its strength and biocompatibility. The outer rings come already fabricated from an outside manufacturer and are made from machined bar stock. Lock rings and wire, used to hold the cuff in place, are also made from titanium. The polyester comes in the form of tubes. All plastic components are deburred by the supplier, which involves removing any bumps from the surface. Occasionally the valve manufacturer may have to deburr some parts. The pyrolytic carbon coating is produced by depositing gaseous hydrocarbons (usually methane) onto a heated graphite substrate at temperatures of 3,272-4,172°F (1,800-2,300°C) in a chamber. These gases break down into carbon. The inner rings are made from 100% pyrolytic carbon using a fluidized bed process at another manufacturer. This material's atomic microstructure helps resist cracking, making it ductile. However, the processing method can still introduce microcracks that must be detected. 1 The majority of components are made by a third party, except for the polyester cuffs. These are made by a sewing process that includes various looping, folding, and stitching steps. The manufacturing process therefore consists mainly of various assembly and inspection steps. 2 Assembly takes place in a clean room to avoid contamination. The leaflets are attached to the inner rings, which are then placed in the housing or outer ring. 3 While this is being down, the sewing cuffs are being made. A special pressurized heating process is then used to form the cuffs around the valve, which takes place at several hundred degrees. The valves are then mounted into a rotator assembly, which the surgeon uses for implanting. 4 After the valves are assembled and tested, they are sterilized in a double plastic container. Steam sterilization is used, which involves temperatures up to 270°F (132°C) and times of 15 minutes or more. To make sure the sterilization process has worked, a biological indicator is placed inside. If the indicator shows no growth of bacteria or other viable organisms, the valves and its packaging have been properly sterilized. Each plastic-encased valve is then packaged in a box for shipping. All components are inspected visually, dimensionally and functionally prior to assembly to make sure they meet specifications. The diameter of each ring is measured and assigned a size, which is then matched to the appropriate bileaflet to make sure they will fit together. Microscopic analysis using high power magnification is used to check components for scratches. In total, up to 50 inspections are made during the assembly process. Proof testing is used to determine the structural quality of potentially flawed heart valves. In this method, a valve is loaded to a certain stress level using a special pressurization fixture to see if it will fail at this stress. During the stress test, acoustic emission technology is used to detect minute cracks that might go undetected so that these valves can be rejected. Once the valves are sterilized and packaged, they are inspected to make sure the labels are accurate. Due to the stringent quality control procedures, there is little or no waste produced during the assembly process. Any scrap material is recycled if it is feasible. Defective components are returned to the manufacturer. Some chemicals used for cleaning must be disposed of properly following safety regulations. Blood clotting is still a problem with mechanical valves and manufacturers continue to improve designs, sometimes using super-computing modeling tools, as well as surgical procedures. The shape of the orifice is being improved to reduce pressure losses, turbulence and shear stresses. Flow area is maximized by using stronger materials, which minimizes wall thickness. Tapering the sides of the valve pumps blood more efficiently. Operations are also being developed that only require a 3-4 in (8-10 cm) incision instead of 12 in (30 cm). Manufacturing efficiencies will continue to improve. Researchers are looking at making heart valves out of plastic material that are flexible enough to simulate the opening and closing action. This approach may not require anticoagulation drugs. Others are working on developing artificial heart valves made from a patient's own cells. Experiments have been successful using sheep. Both developments may take decades before they are put in practical use. "Baxter Announces Name of Cardiovascular Spin-Off." PR Newswire (January 14,2000). Dolven, Ben. "Take Heart." Far Eastern Economic Review (November 4,1999). Lankford, James. "Assuring Heart Valve Reliability." Technology Today (Summer 1999). "Maker Recalls Heart Valves." Newsday (January 25, 2000): A49. "Medical Carbon Research Institute Announces On-X Prosthetic Heart Valve CE Mark Approval." Business Wire (July 24, 1998). Reed, Stephen. "Sarasota Doctors Trying Out a Better Artificial Heart Valve." Sarasota Herald Tribune (June 5, 1998): IA. "Researchers Grow Artificial Heart Valves in Sheep." Reuters Ltd (November 7, 1999). Stemnberg, Steve. "In Medicine, a Shortage Prevented." USA Today (August 3, 1998): 06D. "Medtronic Announces First Implant." Medtronic, Inc. http://www.medtronic.com (December 29, 2000). "St. Jude Medical Announces One-Millionth Mechanical Heart Valve Implant." St. Jude Medical, Inc. (April 6, 2000). http://www.pmewswire.com (May 2000).